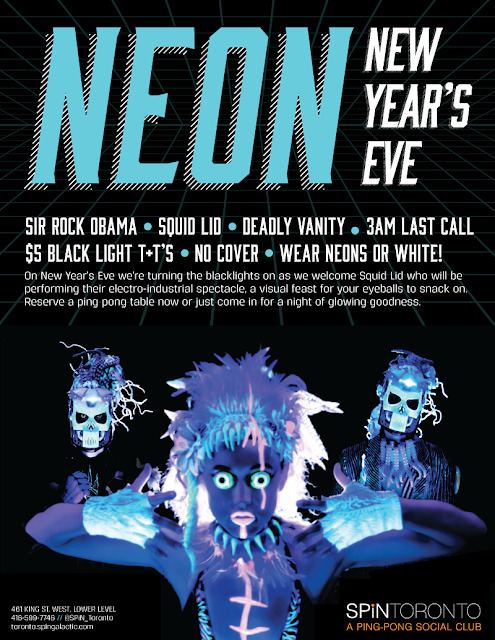 SPiN Toronto, the city’s ping pong social club is hosting an awesome NYE jam with a NEON theme! NO COVER --> Doors open at 8 p.m. Last call at 3 a.m. Featuring electro-industrial spectacle performances by Squid Lid. DJ sets by Sir Rock Obama and Deadly Vanity. Play ping pong, drink, eat and dance while you ring in the new year.